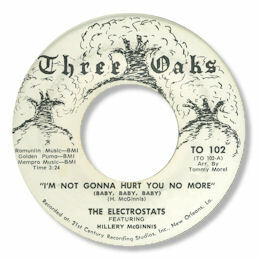 The tiny New Orleans label Three Oaks had at least one other fine 45 by Walter "Wolfman" Washington in addition to the insidious ballad by the unknown Electrostats. I love the rather "flat" delivery and deliberate intonation of lead singer Hillery McGinnis as well as the nice girl harmonies. But most of all I'm Not Gonna Hurt You No More sticks out because of its terriffic melody and on the button chord changes. The feel and arrangement of the piece reminds me very much of the beauty of the 45 by the Blues Brothers #1. More superb 70s group soul. UPDATE ~ Both Peter Hoogers and Greg Burgess have written about another Electrostats 45 now added to the discography. While "Weak as you want to be" isn't quite up to the standard of "I'm not going to hurt you no more" it is a pretty good mid paced ballad with some fine singing by Hillary (sic) McGinnis. I'm grateful to both Peter Hoogers and Greg Burgess for their help and info.